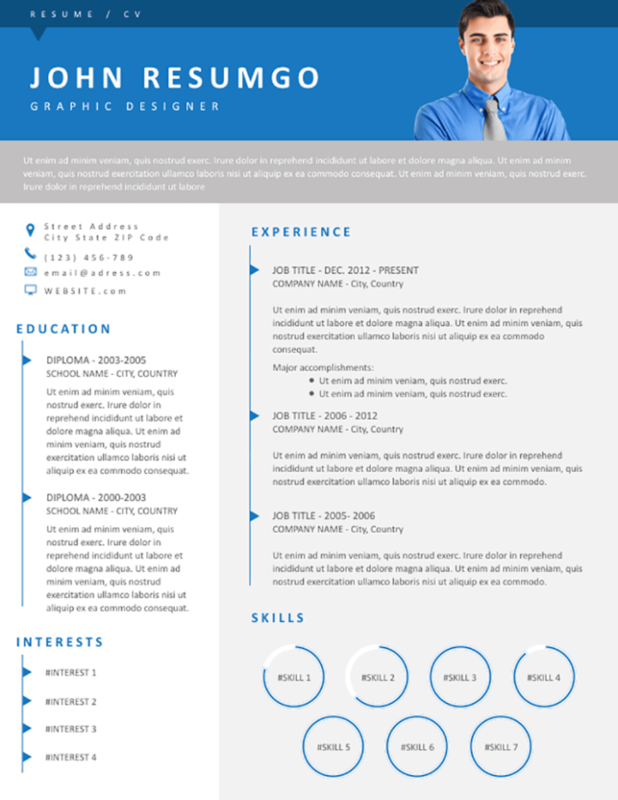 Urias is a free resume template with a full-width blue banner. Modern two-column layout with a white and gray background. On the blue header banner, insert your name, and job title. This resume can be used either with (ideally with a transparent background) or without an ID photo. Then come a sub-level header banner, with a gray background. Use this placeholder for your profile/objectives statement. Below, your information is divided into two columns, with different background colors to clearly differentiate one from the other, making your CV easy to read. Each key information listed is introduced by a triangular bullet (and a vertical line connecting each bullet). On the left side, on a white background: your contact information, your education, and interests (list). Your education and skills (donut charts) go to the main (right) part and uses a light gray background.